Product prices and availability are accurate as of 2019-04-06 04:33:30 EDT and are subject to change. Any price and availability information displayed on http://www.amazon.com/ at the time of purchase will apply to the purchase of this product. This personalized state cutting board is a real novelty. A perfect gift for anyone who loves their great state. It is a perfect wedding gift or housewarming gift. Made from 100% rapidly renewable bamboo, these boards are ultra-light and super-strong. Ideal for both indoor and outdoor entertaining, they can be used as a cutting or bar board, cheese tray, serving platter or simply as a conversation piece. The board can be hung on the wall by its rustic leather hanging loop. These bamboo boards are: - Harder than rock-hard maple, yet easy on your knives - Triple sanded for super-smooth finish, then treated with beeswax & mineral oil - Organically grown - No pesticides or fertilizers - Rapid growing and renewable resource To clean, wash by hand with warm soapy water (do not put in dishwasher). 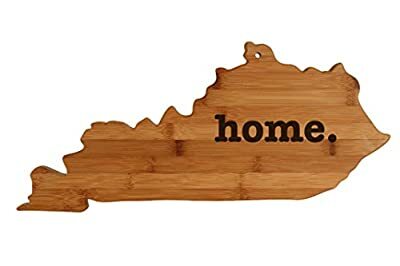 The Kentucky board is approximately 18 x 8.5 x 0.5"